Intermittent fasting is not a traditional diet…in fact, it’s not a diet at all. In simpler terms…it’s making a conscious decision to skip certain meals. Intermittent fasting means consuming calories during a specific window of the day and making the choice not to eat food during the rest of the day. If you are struggling with your weight it could be one of the most powerful interventions to help because it helps to shift your body from burning sugar/carbs to burning fat instead as its primary fuel source. Intermittent fasting is not about starvation followed by binge eating…or any other form of extreme dieting/weight control. Intermittent fasting is about timing your meals to allow for periods of fasting. For example you can choose to eat regularly during a designated time period…from 11 am to 8 pm or noon to 8 pm. You can also choose to skip a few meals by taking a leave from eating for a full 24 hour period. In this example you might finish a nice dinner at 8 pm and then not eat again until 8 pm the following night. There are many different variations, some people choose to fast a couple of days a week or every other day and some prefer to use this method daily. To really be effective, the length of your fast should be at least 16 hours. Although some people choose to take their window of eating down as far as two hours, you can still reap many rewards just by limiting you’re eating to an 8 hour window because it takes about six to eight hours for the body to metabolize your body’s glycogen stores…not until then does your body shift to burning fat. If you continue to eat every eight hours or sooner, you are replenishing your glycogen and making it more difficult for your body to use your fat stores as fuel. Intermittent fasting does not require you to restrict how much food you consume, however eating tons of junk food just because you are not in your fasting period is very counterproductive to what you are trying to achieve. If you choose to fill up on junk food all the benefits of fasting are lost…what’s the point? Intermittent fasting should really be considered a lifestyle change that includes making wise and healthy food choices, paying attention to proper nutrition and doing things like minimizing carb intake by replacing them with healthy fats like coconut oil, butter, eggs, avocados, nuts, and olive oil. Patience is the keyword for this lifestyle change as it generally takes a few weeks to shift into fat burning mode…but it’s well worth the wait because your cravings for processed carbs ad unhealthy foods will seem to disappear as if magic. 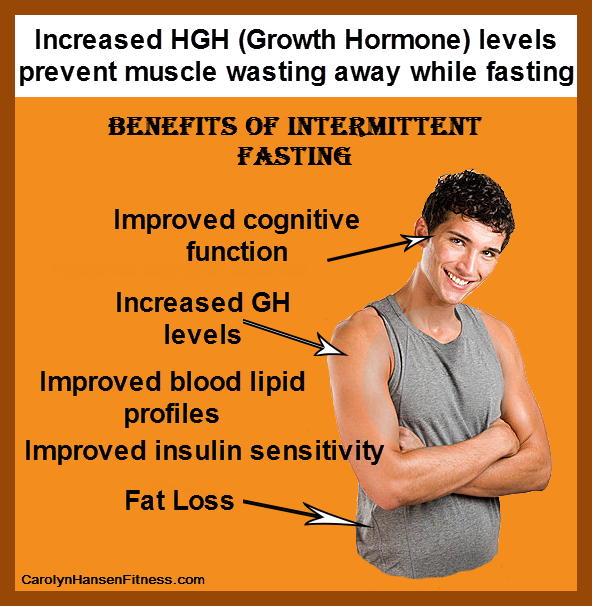 Intermittent fasting not only works to turn you into an efficient fat-burning machine but research shows that fasting also triggered a 1,300 percent rise in human growth hormone (HGH) in women and an even more shocking rise of 2,000 percent in men. HGH is often called the “fitness hormone” because it plays a vital role in maintaining health, fitness and longevity. It promotes muscle growth and boosts fat loss by kicking up your metabolism. Because it builds muscle and at the same time promotes fat loss is the reason HGH helps you lose weight without losing muscle mass. Intermittent fasting is a tool that can help teach your body to use the food it consumes in a much more efficient manner. Are you ready to take the bull by the horns and take that stubborn weight off once and for all? Are you finished being in a constant state of war with your body? “Stop Weight Loss Resistance” can help and answer a lot of your questions. My comprehensive program was created for people just like you…that have the desire and the will to lose but need proper coaching and direction.